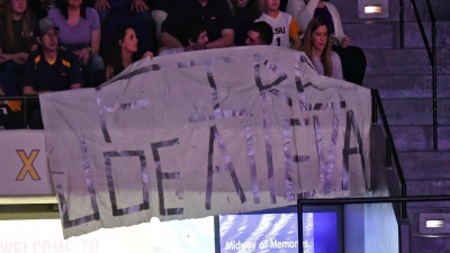 BATON ROUGE- Students and fans shared their thoughts on the Will Wade suspension with chants and signs at Saturday nights basketball game against Vanderbilt. The section took a bold stance and boo’d LSU Athletic Director Joe Alleva when he entered the PMAC and they immediately followed the booing with of course chants. “Free Will Wade,” echoed throughout the PMAC as the Tigers face Vanderbilt for their final game of their regular season.